By now we are all used to movies, books and TV specials featuring the stories we first heard about on the news. Often the subject matter depicted in such projects is sensationalized and dramatized to the point of exasperation. News from the Middle East are ripest for the picking these days, with stories that run the gamut from a thirty-something blogger starting a revolution in Egypt, to Navy Seals killing the bad guy in Pakistan, to a feared dictator being given a run for his money by NATO forces and his own people in Libya. We can be sure these scenarios will all make it into our living rooms, dramatized and reenacted, sooner or later. But in Mohamed Diab's daring new film Cairo 678, one of the most disturbing headlines of the year was actually predicted. In a scene so tactfully shot -- yet so emotionally haunting that I still think about it weeks after first viewing the film -- one of the three female protagonists is separated from her doting husband at a street celebration after a football game, and violated. For a woman, it was a cinematic moment as frightening and infuriating as listening to reporter Lara Logan recount her real ordeal on TV's 60 Minutes earlier this month. Way too close for comfort. The idealistic among us have found real satisfaction in the principles of a newly freed Egypt, Tunisia, et al. But on a recent edition of the Doha Debates from Tunis, the debates chairman Tim Sebastian addressed concerns over the anarchy now palpable on the streets of Tunisia, and political analyst Kamal Ben Younes pointed out that cutting the head of a snake does not guarantee the body of a dictatorship will stop moving. If the most recent headlines from the region are any indication, the revolutions in MENA will change those at the helm, but the people, the struggles, the religious, gender and class differences will end up remaining the same. It is those differences that are gracefully but thoroughly explored in Cairo 678. 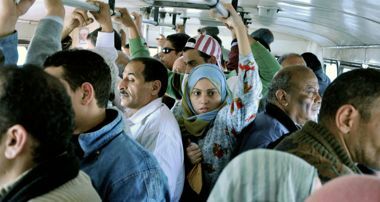 Filmmaker Diab clearly draws the line at what a woman's rights should be in Cairo 678 -- the title refers to the number of the bus where a pivotal scene takes place -- regardless of her financial situation, religion or background. But he also very smartly steers clear of taking sides. He does not show women who are perfect -- quite the opposite. The women of Cairo 678 are rather complex individuals with their own convictions, their own opinionated judgments of others, who are also eventually able to learn from their mistakes. That's because the stories featured in Cairo 678 are inspired by the real life struggles of three very different women, each unique yet representative of many others. In a country where 83% of women have experienced sexual harassment and 62% of Egyptian men have admitted to having harassed a woman, the characters of Fayza, Seba and Nelly are not exceptional. I sincerely applaud all the actors and actresses involved in Cairo 678, because with such a richly emotional and raw film, its success lies heavily in the power of the performances. From the leading ladies to the supporting male roles played so honestly by Omar El Saeed, Basem El Samra and Ahmed El Feshawy, the talent obviously abounds here. The characters and incidents of the film weave easily into one another. Fayza (played by Boushra, who also produced the film) is a Muslim Hijabi mother and wife who helps to support her family. Despite her conservative appearance, she is plagued by harassers, both on the street and on the bus she takes to and from work. Eventually, she is pushed to her limit and soon reacts in a way that will both surprise her country and inspire her fellow women. Seba (Nelli Karim) is a modern, wealthy jewelry designer, married to a successful doctor. After suffering a gang attack and watching her marriage deteriorate, she begins to counsel women in the art of self-defense. Nelly (Nahed El Seba'i) is a young, passionate amateur stand-up comedian, engaged to be married to a man she adores. When she is grabbed outside her mother's house by a man in a moving pick up truck, she refuses to be a victim. Instead of backing down -- as everyone advises her to do -- she files the first sexual harassment suit in Egypt. Cairo 678 is the story of these three women as they find themselves on a journey -- along with police inspector Essam (Maged El Kedwany) -- which will redefine courage and what is right for their entire country. Before you go thinking that violence against women is a phenomenon present only in the Middle East, think again. In 2006, the UN Secretary General's Report on Violence Against Women stated that "violence against women persists in every country in the world, constituting a pervasive violation of human rights and a major impediment to achieving gender equality. On average, at least one in three women is subjected to violence in the course of her lifetime." It is, as Diab states in his Director's Notes, a "problem without a passport." Cairo 678 is an important film -- one all women should watch and all men should pay attention to. It was recently featured in the New Directors, New Films season at MoMA and will play next at the Seattle International Film Festival, as part of their "Open My Eyes" program, on May 20th and 21st.